The easy-to-mount gutter of Artegronda. Our gutters in pre-painted galvanised sheet are absolutely the easiest, quickest and safest gutters to be mounted. Ideal for do-it-yourself and minor construction works. 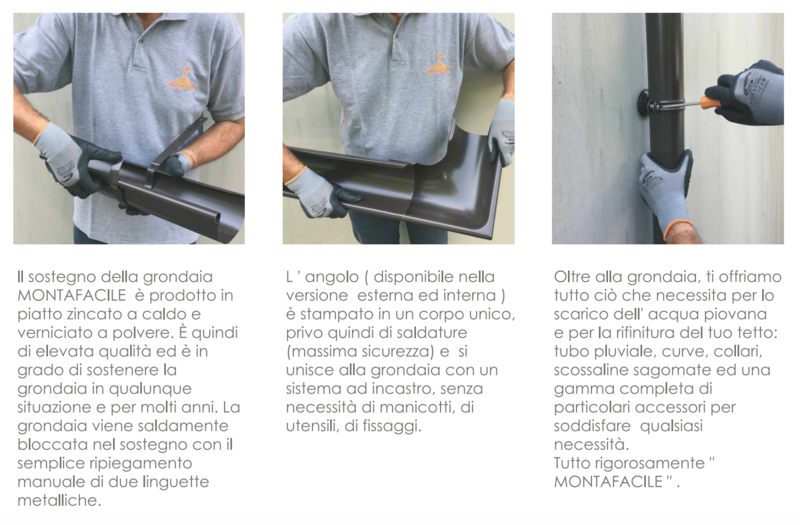 Material: Pre-painted sheet, dark brown colour, in DX 51 hot galvanised steel and pre-varnished with polyester paint. This high-grade material is widely used in the production of gutter eaves and sheet metal works in general. All Artegronda components have a 10-year-warranty against corrosion. 1. 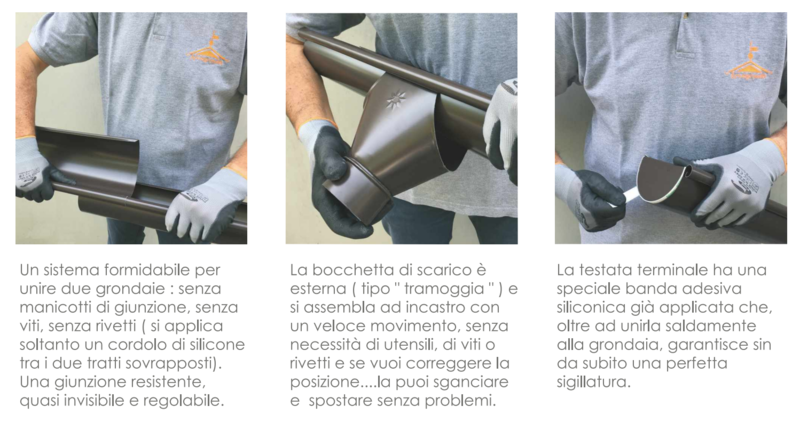 Its shape is intentionally simple and sober (semi-circular) because the joints have a greater adhesion force and they are safer than the gutters with complex shapes. The use of flashings makes up for any further need of roof covering. 2. The external curl bestows great linearity to the profile of the gutter, besides a ladder can be easily leant against it and you can safely catch hold of it with no risks of cutting your fingers. Any possible snowdrift from the roof-pitch easily slides on the back of the curl and, anyhow, usually cannot bend it. 3. The lower part of the curl remains detached from the body of the gutter for two reasons: the curls of two gutter rods to be seamed can be inserted one into another, thus realizing a strong and resistant connection with no need of screws and rivets or limiting their use as much as possible. Should the rainwater overflow from the gutter, it gets interrupted between the curl and the valley gutter, it perpendicularly falls onto the floor without pouring out against the façade. 4. IThe roof and the gutter dilate in a different way; for this reason they cannot be joined in one single body. Should this happen, the different dilatation would release in the joints, thus affecting the sealing and causing risks of leakages. The gutter must remain suspended in the hangers but separated from the roof and free to swell. In this way the joints will not be affected. 5. The gutter shall NEVER be drilled for any reason whatever in the area where the rainwater flows. It would be like drilling a bath-tub. 6. The drop outlet between the gutter and the pipe shall be external and collect water as a funnel. The inner “stub” outlet implies a drilling of the gutter and the use of rivets and a sealing cord around the hole, which causes backwater close to the drain area. 7. The joint seam to obtain an edge (external or internal) represents the weakest point of the gutter, therefore subject to risks of leakages. The edge in accordance with the standard DIN 612 avoids this kind of risk, since it has been forged in one single piece. 8. The gutter must always be sustained by strong external hangers and shall not be hold from above by means of internal tie rods. The sealing capacity of an external shaped hanger is definitely higher and lasting over time besides offering more resistance to the loads due to snow, water and hail.